The lighting in your dining area helps set the tone for your meals and there is nothing more beautiful and elegant than a chandelier. However, you have to choose the right one if you want to create the best look for your dining room. Have you ever walked into a home and the chandelier seemed to overpower the rest of the décor or perhaps it just looked awkward and out of place? You can avoid this scenario when you plan ahead and consider your choices carefully. Even if the chandelier is the focal point in your dining room, it should complement the area, not draw attention away from the rest of the décor. Every piece in the room should flow together in harmony and it can when you follow the steps below for choosing your dining room chandelier. Before choosing a chandelier, consider the distance between the ceiling and floor to help you determine the length and type of the chandelier base. 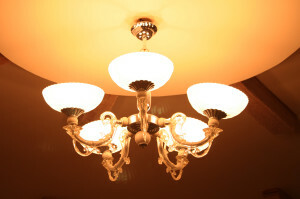 The bottom of the chandelier should be at least seven feet from the floor so the average size person can walk underneath without any problems. You also want to make sure it sits around thirty to thirty-two inches above the top of the table if you have the standard eight-foot ceiling. If you have the high cathedral ceilings and lots of open space, normally you’ll go up three inches for each additional foot. The width of the chandelier will depend on the size of your dining table. To make sure the fixture is in proportion with the table and chairs, it should be half the size of your dining room table. For example, if your table measures fifty inches wide, the chandelier should be approximately twenty-five inches wide. If your chandelier is not the correct width, it will look awkward and out of place. Now that you know what size and base type to look for, you can shop for the style of chandelier that suits your needs the best. From the traditional crystal chandelier to the rustic design, there are many different styles to choose from that will match your personality and décor perfectly. When choosing a style consider how you plan to use the dining room. Will you use it for family dinners or is it for entertaining guests only? Do you want something elaborate that will be the focal point of the room or something more subtle? Another thing to consider is how much light you need to ensure the dining room is well lit and comfortable. Chandeliers can change the whole look of your dining room and there are many beautiful and stylish designs available for any kitchen design project. If your chandelier is too small, it won’t provide adequate lighting and if it’s too large, it can be overwhelming and look out of place. Take time to measure and find the right size for your dining area. The perfect size will pull the look together so everything in the room will be balanced and look great.